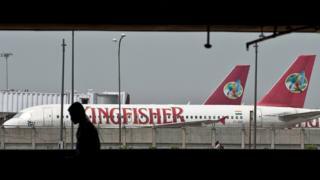 India has revoked the passport of business tycoon Vijay Mallya accused of hiding in Britain over billions in debt from his defunct Kingfisher Airlines. There is an arrest warrant for Mr Mallya and Delhi says it is considering seeking his deportation from the UK. The flamboyant businessman is known as India’s Richard Branson for his investment in aviation, Formula 1, Indian cricket and the drinks industry. His debts were triggered by the failure of his Kingfisher Airlines in 2013. Authorities have given the businessman one week to answer why his passport should not be impounded or revoked. He is believed to have some $1.4bn (£1bn) of unpaid debts after the collapse of the airline and is thought be in the UK. Mr Mallya has dismissed allegations that he left India because of the outstanding debt and also criticised his “media trial” over the issue. In March, he was blocked from receiving $75m severance pay from British drinks giant Diageo. The heavily indebted businessman was due to receive the money after being ousted from the firm in February. But a consortium of banks and creditors had demanded the money should be used to settle some of Mr Mallya’s outstanding debt to them.